Our chiminea lid KEEPS THE SPARKS FROM FLYING STRAIGHT UP INTO THE AIR. We recommend using our lids in conjuction with our built in spark screens. The lids work fine by themselves but we suggest installing our spark screen inside the chiminea smoke stack. The screen comes with irregular edges. We do this on purpose to help hold the screen up the chiminea stack. The irregular edge is not an issue of poor quality. Smoke and embers fly up and hit the top and are reflected back. In certain parts of the Country it's required by the law. You must save some sort of spark arresting screen on open fires. Check your local fire codes. chiminea under a covered area. Plus our lid is a rain cap as well. When it rains it will help keep your chiminea from filling with water. remove the cap and put a cover over the chiminea. 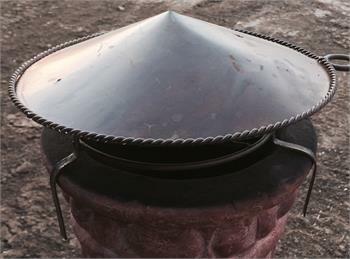 The Mexican style chiminea lid is handmade in Mexico. Everyone is a little different it it's own rustic way . This is what goes this lid character. Our Chiminea lids fit almost every chiminea I have seen made. The lid measures app. 12" in diameter and 6" tall. But sizes are slightly irregular. outside diameter of the smoke stack. Comes in flat black or Stainless Steel. The design of the lid may differ then pictured as these are custom made.